In today’s world, students must prepare themselves for a wide range of college and work opportunities. All students want to lead a happy life and enjoy the good things the world has to offer. Our students will certainly be provided a quality education. This year I am working with our junior high students as they learn and master a wide range of 21st Century Skills. In this year’s “Technology Applications” class, students will learn and master various topics associated with computers and technology. For a list of the various technology topics covered in this course, CLICK HERE for a PDF file. CLICK HERE for a Microsoft Word document. Over the past few weeks, 6th graders have demonstrated what it means to be an "Independent Learner". Upon completion of Module 2 (Digital Citizenship), students selected their own path of learning by choosing from a wide range of Self-Learning topics. Currently, my 140 - 6th graders are engaged in 12 different "Self-Learning" modules. Throughout the Fall Semester, students completed a number of assignments and projects as they worked through their various modules. After creating a "Letter Head" as a graphic design project, this student was asked to compose a business letter in a subsequent assignment. This student was asked to take her graphic design skills and create a flyer announcement to an event of her choosing. Many learning modules require online lessons at Learning.com. Upon completion of Code.org (Level 2) coding activities, these students earn their certificates. Knowing how to "Touch Type" is an important skill to have. 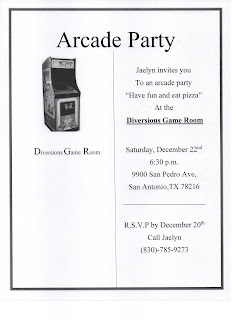 This student used her Microsoft Word skills to create an invitation using a "Column" format. Graphic Design skills have "Real-World" application. As one of two final projects for "Computer Hardware", students direct potential technology consumers to designated websites using QR Codes. In the "Wed Design" module, students create a websites using "Google Sites". As a final project together as a class, students were asked to practice their Graphic Design and Microsoft Word skills by creating projects of their own topic or theme.